For efficient equipment tracking and rental management, EZRentOut comes with a predefined set of fields. However, we understand that every business is unique and you may need some custom fields as per your specific needs. For this, we provide Custom Fields, which can be used to track any data point with an item or order added to our equipment rental software. 1) How Do Different Industries Utilize Custom Fields? 2) What Can Be Tracked with Custom Fields in EZRentOut? How Do Different Industries Utilize Custom Fields? Media and Production Recording the focal length of a camera lens, keeping a tap on whether a flashlight is buzzed. Equipment and Construction Tracking Job Numbers, the condition of the equipment checked out, recording any damages on return, setting up maintenance alerts. Event and Party Planners Size of the stage, custom theme or standard design, recording whether it should be sent for quick fixes after return. Education Specs of laboratory equipment, Installed OS on university computers, Installed programs. Let’s dig a bit deeper! What Can Be Tracked with Custom Fields in EZRentOut? Below we’ll discuss custom fields for items and orders. Custom fields for users, customers and vendors will be explained in a subsequent blog. For Items: You can add custom fields from More -> Custom Fields -> Items -> Add Custom Field. A custom field can be many field types, e.g. radio buttons, dropdowns, multiple choice, text fields, date fields, etc. Warning: Custom field for Items can be edited/deleted, however, you cannot change its type once it contains pre-existing data i.e. recorded or associated to an order. 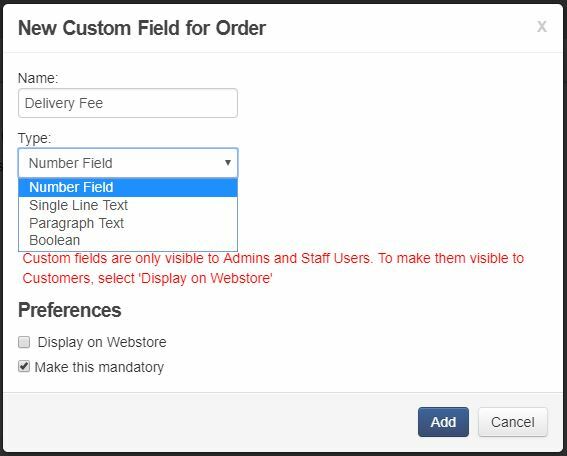 Warning: Custom field for Orders can be edited/deleted, however, you cannot change its type once a custom field is created. The ‘Display on Webstore’ option under Preferences can be used to show custom fields on the webstore. This means it will be visible and accessible to all your customers on the cart page under ‘Additional Information’. Useful in scenarios where the customers want to leave special instructions for the delivery guy. Note: Custom fields are only visible to admins and staff users unless Display on Webstore is selected. Boolean values are included in all custom field types except Items. They are great for providing quick insights about your workflows. Is a customer eligible for a raffle? Do you have a discount code with a vendor? You can ask users ‘Yes/No’ questions and quickly process their answers. You can, for example, use these insights to figure out whether an Order requires deliveries, or if Order items were verified before being rented out. You can even run an Order Report and collate the custom field’s Yes/No responses for a better understanding of rental trends or bottlenecks. It is important to note that the custom field has to be mandatory for the boolean value type. This is because users must choose either a Yes or No value; not filling in either checkbox provides data that ultimately isn’t meaningful. Note: This custom field will only appear on item details pages that belong to the group associated with it. You can add custom fields of your choice on Rent Out/Return Order forms. The ‘Display on Rent Out Order’ and ‘Return Order’ options are available under Preferences when you’re adding/editing a custom field. Selecting ‘Display at Rent Out’ will show this custom field on the Rent Out form. The user can enter a new value for this field. If you select ‘Only record with Rent Out Order event…’, the value entered by the user when renting out items will NOT be updated with the item. It’ll only get recorded in rent out events log. These logs appear under an Item’s Details Page -> History button -> Check-in/out History, and More -> Reports -> Checkout events. Learn more about Item Reports. Similarly, you can configure how the custom field(s) will ‘Display on Return Order’. You can also make it mandatory for the users to add a value on return order form. Note: All above preferences can be used for any type of custom field for items only. You can also enable date alerts using ‘date field’ type custom fields. For example, you may want to get an alert when a laptop battery expires. For scenarios where some equipment requires regular servicing, you can set up recurring date alerts e.g. a Forklift Truck requiring inspection every 2 months. When creating a date alert custom field, you can either set to receive a notification on a specified date or setup recurring date alerts e.g. every year for 3 times. An alert in advance can also be enabled for this type of custom field. Learn More about setting up date alerts. On enabling ‘editable by staff user’, all users in your company will be able to view and edit this custom field. On the other hand, ‘restricting visibility to administrators’ will only allow the admins in your company to view this custom field or edit it. One of these two options can be enabled at a time. Keep a history trail of how a custom field value is changing over time for a particular item. Make sure that the ‘Save History’ option is checked under preferences for the custom field(s) for which you’d want to have a history record. Say you have a custom field called OS for your Macbooks. You can track when was the OS updated to Yosemite from Mavericks, and who made that change. You can also export the history trail to a CSV. Though the custom fields can be recorded and displayed on all types of items and rent outs/returns. However, you can also choose to display a custom field on add stock forms. Enable it under the preferences for custom field you’d want to display. Any custom field can be printed on a Print Label. You can also have a custom field shown when someone scans the QR Code for an asset. Enable Company Settings -> Show on Public QR Code Page -> Custom Fields. You have the option to edit/delete any custom field under More -> Custom Fields. Warning: Deleting a custom field also deletes all the associated values. Say your Camera Lens have a custom field ‘Focal Length’. Deleting Focal Length will remove this custom field from all lenses, and also delete all recorded values. This action cannot be undone. On an action taken on an order e.g. rent out or return items, all the custom fields associated with the added items in that order will show up in the rent out/return order forms (as shown above in the rent order form). You can edit a single item to update the custom field values. Or you can select a bunch of items on Asset Listing (Items -> Assets) and from Actions -> Edit, edit custom fields for all of them in a single go. Same goes for inventory and asset stock listings. Say, you have a stock of 10 camera lenses that are 65mm. You can mass edit all of them to update their focal length to 85mm. The best part is that you can edit the Asset, Inventory, and Asset Stock listing tables to include columns that are more important to you. These columns can also include custom fields. Learn More on Customizing Columns in Listing Pages. You can also customize filters using custom fields from the Items Listing Page. All items – whether assets, asset stock, or inventory – can be sifted through using custom filters. To set these up, go to Items and click the ‘Custom Filters’ button highlighted below. Choose ‘Create New’ from the overlay to begin setting up a filter. If you’ve custom fields set up in your account, you can even add those as elements in your order printouts! Item custom fields can be added to the Order Line Items section, and Order custom fields can be added to the Details Before/After Line Items sections. Learn More on Customizing Order PrintOuts in EZRentOut. Custom fields set as ‘date field’ under types when you create/edit a custom field receives an email alert on a specified date or recurring intervals. Data for all the custom fields can be imported to your EZRentOut account from an excel sheet. The custom fields are available when you’re mapping columns during the excel import. Make sure to create all the required custom fields from More -> Custom Fields -> Items before importing data for them. Learn More: What to be careful of when importing items from an Excel sheet? 1. You can also get more insights that involve custom fields from More -> Reports -> Custom Reports -> Custom Fields Report. These reports can be filtered. You can export these reports to CSV format or upload them to your Dropbox account. 2. You can retrieve all your custom fields data and custom fields history recorded in our system via API calls. Get API for Custom Fields here. 3. Custom Fields can be searched through as part of the general search function. Learn More about search limit for custom fields. We believe in making our equipment rental software even better than yesterday. Custom fields for orders can also be utilized using EZRentOut’s mobile application. You can view custom fields on an item’s details page and edit custom fields while making changes to an order from the mobile app. They are not viewable/editable when taking actions like rent out/return. For more assistance, drop us an email at support@ezrentout.com. You can also share your ideas on our Community Forum. Visit our knowledge base or blog for more support posts on our equipment rental software. This entry was posted in [Support] and tagged custom data, custom fields, equipment rental management, items, order management, orders by admin. Bookmark the permalink.